Don’t miss a big savings on one of the best treats! 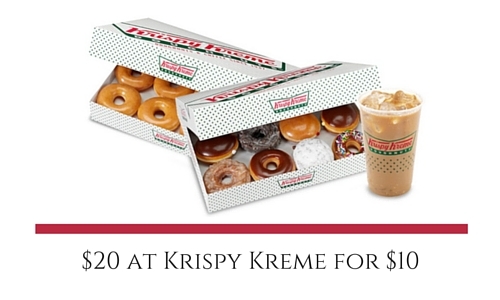 Right now you can get a $20 voucher to spend on anything at Krispy Kreme for only $10. This is available in select cities, so head over and search the site for “Krispy Kreme” and your city to see if it comes up. For me it was up on the front page in my area as soon as I logged in! While I’m trying to be good, this is a perfect present for my husband who can’t ever resist the hot now light. Note: The promotional value (the extra $10 credit) expires on 8/26, so you have 5 weeks to use this. After 8/26 it will be worth the $10 you paid for it. Heads up! Select Groupon members can also get a $10 Starbucks Gift Card for $5. Check your e-mail to see if you are eligible for the deal.